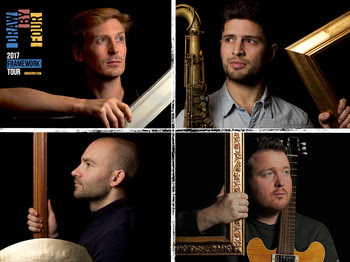 Described by Chris Cheek as "dynamic and evocative adventures from soulful and skillful players - a refreshing and groovy band", saxophonist Jon Shenoy's band includes organist Will Bartlett, drummer Chris Draper and one of the North's premiere guitarists, Sam Dunn. 2017 is a busy year for Draw By Four, having secured a 24-date UK tour in the lead up to recording and releasing their first album, FRAMEWORK. With a line-up steeped in tradition, Draw By Four take the classic 60s organ quartet into brand new territory where the compositions from leader Jon Shenoy (Ivo Neame Large Ensemble) mix contrapuntal bass lines and rhythmic hooks with thoughtful lyricism. Mixing stark ethereal voices with gritty Hammond boogaloo, organist Will Bartlett (Jim Mullen, Salena Jones) draws on a wide palette of sounds that build the foundation for an infectious mix of groove-based original compositions, enchanting ballads and unique arrangements of avant-pop songs. The FRAMEWORK tour also includes a suite of compositions written in response to paintings by three British painters: Winifred Knights, JMW Turner & Gill Holloway. In the spirit of jazz and innovation Draw By Four will encourage the audience to enjoy an enhanced visual experience – marrying the works of the above artists with the music. For full tour dates, check out Jon Shenoy's website.